Members of the Purdue Veterinary Technology Class of 2020 are joined by Veterinary Technology Program Director Bianca Zenor for a group photo at the 2017 Veterinary Technology Stethoscope Dinner held on Monday, August 21, at the Purdue Memorial Union. 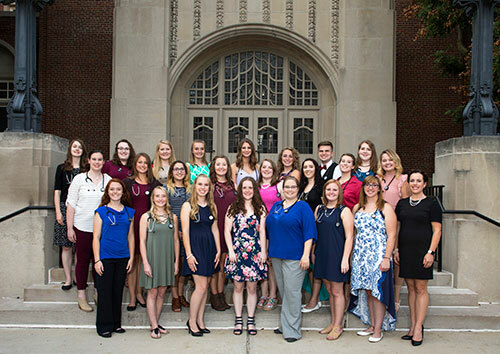 Second-year Purdue Veterinary Technology students gathered Monday evening, August 21, at the Purdue Memorial Union for an event that has become a special tradition associated with the start of the new school year. The event was the sixth annual Veterinary Technology Stethoscope Dinner, which marks the start of the clinical phase of the students' education. The members of the Veterinary Technology Class of 2020 enjoyed a celebratory dinner and networking opportunities in the PMU West Faculty Lounge before picking-up their free stethoscopes and signing the Veterinary Technician Code of Ethics, which will be displayed outside the Veterinary Teaching Hospital pharmacy. The annual event is sponsored by Boehringer Ingelheim and Patterson Veterinary. During the dinner, the students heard from Veterinary Technology Program Director Bianca Zenor and Associate Dean for Academic Affairs Kathy Salisbury as well as Dr. James Stepusin from Boehringer Ingelheim and Mr. Rob Fulkerson from Patterson Veterinary. At the conclusion of the event, the members of the Veterinary Technology Class of 2020 posed for a group photo as they displayed their new stethoscopes.